Surface finish significantly affects the look, feel and overall quality of molded parts. This reference sheet helps engineers select a mold finish that will produce the right results for the material. Surface finish significantly affects the look, feel and overall quality of molded parts. These guidelines help engineers select a mold finish that will produce the right results for the material. The first chart includes SPI Finish guidelines and their equivalents in roughness average (RA), root mean square (RMS) and VDI 3400 for handy reference. 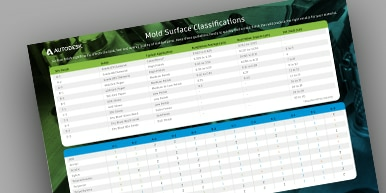 The second chart provides a range of popular material choices in a grid that shows which mold finishes work best for each material and which ones are not recommended.